Sussex-based music charity, AudioActive, has taken a big step towards their vision to establish the UK's first centre for excellence for the talent development of marginalised and under-represented artists in Worthing, thanks to £92,618 National Lottery funding through Arts Council England. "Many of our most promising creative young minds feel like square pegs in round holes in our education system. "The qualities that make them such unique, promising artists and who aren't afraid to challenge convention or take risks, can often make them hard to nurture within formal institutions. "We've been working on a way to support these awe inspiring young people for a long time. "This support from the Arts Council means we can now push on with our 'Square Holes' programme, which aims to level the playing field for such young people and emerging artists." Square Holes will include a host of R&D and pilot projects in Worthing, laying the foundations for the Centre of Excellence including: an emerging artist development pilot programme; establishing weekly grass-roots drop-in workshops in underserved communities; researching and identifying suitable premises for the Centre of Excellence; a series of professional gigs aiming to kick-start a contemporary urban and electronic music scene in the town and provide platforms for local emerging artists to perform on the same stage as internationally successful artists. The first of these events will be co-presented with triple Brit Award winner Rag'n'Bone Man, who is a Patron of the charity. "AudioActive do amazing work and I"m proud to be part of this project in Worthing. "At school I was never told by a teacher that I could ever have a career in music. Square Holes is important because it will bring hope for loads of kids who are just like I was." 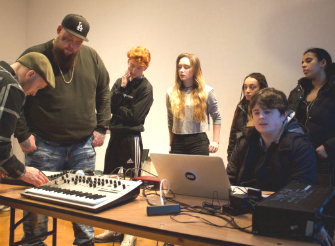 Square Holes will build on the work of #ScratchPad, an Arts Council funded project that put the spotlight on young people making music in Worthing.